Boxers are typically muscular medium to large-sized dogs. Because of their strong build, they eat more than other dog breeds. Boxer breed dogs are also very energetic and playful. They like running and moving around most of the time. This high enthusiasm and activity should be supported by a diet that will meet his nutritional needs. Boxers’ nu﻿tritiona﻿l needs vary depending on how active they are. The more energy they expend, the more calories they will need to have to sustain a good health. The needs may vary in quantity and, serving size or dosage, but there are general nutritional requirements that boxers need. Aside from their level of activity, weight is also a great factor in determining how much calories do boxers need. In general, boxers weigh around 55-70 lbs. Just like other dog breeds, female boxers slightly weigh less than male boxers. Here are estimated calorie requirements for boxers based on their average weight. Typical adult boxers need 1,600 calories/day. Boxers who are more active than the usual or those hunting boxers may need a higher calorie requirement of 2,300 calories/day. Please take note that these are just suggested ideal calorie requirements. If you are planning to make significant changes in your dog’s diet and calorie intake, it is best to consult your dog’s veterinarian. Boxers need a diet with high protein content. Protein is responsible for your boxer’s strong muscle development, bone growth, and tissue repair. Being generally large, muscular, and energetic, Boxers need a higher protein percentage included in their daily diet. Experts suggest 25-30% of protein, while some Boxer lovers advocate of giving more, around 35-45%. In fact, research has shown that an increased protein percentage in a dog’s diet will help strengthen muscles and thus reduce the occurrence of common injuries. Fat is a major component of a boxer’s diet. It is one of their main sources of energy. It plays a crucial role in digestion, helps maintain a stable body temperature, and helps keep your boxer’s coat and skin healthy and shiny. Fat also adds and enhances the flavor of dog foods. Dogs usually need around 15-30% of fat in their diet. But because boxers do not have long coat and hair, they may require less percentage of fat. Boxers also need vitamins and minerals that will support its healthy growth and development. Vitamin A is essential for a healthier and shinier coat and skin. Vitamin B protects the nervous system. Calcium promotes stronger bones and joints. L-Carnitine and Taurine keep the cardiovascular system, especially the heart, healthy. Like us human beings and any other dog breeds, boxers also need clean water. Water helps in the digestion and the body’s absorption of nutrients. At an average, boxers need around 1.3 ounces of water per pound of their weight per day. However, the required amount of clean water for boxers will also depend on several factors: age, level of activity, and weather condition. Carbohydrates provide boxers with energy and they also aid in digestion. There is no minimum or recommended percentage of carbohydrates that must be included in a boxers’ diet. When choosing the right food for your boxers, the price tag should not be the only thing that you should be looking at. There are several considerations that must be taken into account before buying dog food for your boxer. Take time to read the labels on the dog food. This will give you a lot of information about the specific ingredients included in the dog food. An ideal protein content in dog food for boxers is around 30%. Great sources of protein include lean chicken, turkey, tuna, and lamb. Protein that came from chicken or beef by-products are strongly discourages, as they have the lowest forms of protein. There are better alternatives for these such as brown rice, barley, oatmeal, and sweet potatoes. Too much fat put boxers more at risk for having cardiovascular diseases. Boxers’ dog foods should have only around 10-25% of fat (or less) in their diet. It is recommended that boxers are fed at scheduled times. This will allow you to better track how much dog food your boxer has already consumed. This will also reduce chances of getting overweight or obese.It is a bad choice to leave out food for your boxer. Letting your boxer have the choice to eat whenever he wants to may make him gain extra and unwanted pounds. Although this is easier and less work for dog owners, this can cause overeating issues for your boxer. When boxers devour and finish their food in just a few minutes, this can cause digestion problems, excessive gas, and bloating. Encourage your boxer to practice slow eating. This can be done with the help of slow-feeding bowls. Do not overfeed your boxer. This will not only make him physically unattractive, but it can also lead to development of illnesses and diseases. Giving your boxer a piece of your meal encourages his begging behavior. Once you have given in, your boxer may continue to beg in the future. Some food we eat may also have ingredients that are not for dogs. Chocolates, garlic, onions, grapes, raisins, caffeine, are just some ingredients that may poison your dog. Wellness firmly believes in the holistic nutrition of dogs. They boast that this Wellness CORE Grain-Free Original Formula provides balanced nutrition for dogs of different breeds. It is mainly made of turkey meal, deboned turkey, and chicken meal, which are rich in protein and easy to digest. This is beneficial in making sure than nutrients from these protein sources are absorbed by the body, and not being discarded through the stool. This Original Formula is enriched with probiotics that aids in digestion, which is great for boxers who have sensitive stomachs or may suffer from food allergies. It also contains glucosamine, which strengthens and the joints and improves mobility. It is grain-free, and does not contain any by-products, artificial flavors and colors, and fillers. Zuke’s Mini Naturals Dog Treats is a delicious peanut-butter flavored dog food for your boxer. Peanut butter is the main source of protein. This dog food is also enriched with vitamins and minerals. It does not contain wheat, corn, and soy, which makes it ideal for boxers who have food allergies. It is healthy, for it is free from artificial flavors, colors, and by-products. Each mini treat is only 2 calories, which makes this dog food a great treat for training. You can give fairly more treats to your dog when training, without having to worry about him gaining a lot of weight. Not only is this treat great for boxers, but also for almost any kind of breed and any age. This BLUE Wilderness Adult Dog Food is great for boxers for it is packed with protein, which is very essential in the daily diet of boxers. This dry adult dog food is inspired by the diet of wolves, which are known to have high endurance. It contains mainly of delectable meat, such as deboned salmon, chicken meal, and fish meal. It is also grain-free, which makes it ideal for boxers who are prone to having allergic reaction from some ingredients. The BLUE Wilderness High-Protein, Grain-Free Adult Dog Food offers a complete and balanced diet for boxers, for it also include sources of carbohydrates and antioxidants. It contains carbohydrate sources, like sweet potatoes, peas, and potatoes. There are also ingredients, such as blueberries, cranberries, and carrots, that support antioxidant enrichment. Royal Canin recognizes the uniqueness of each dog breed and their nutritional requirements. This is why they have devised a specialized dry dog food for adult boxers. They have especially formulated and designed their dog food to best suit boxers. Because boxers are known to be highly active and have powerful muscles, the Royal Canin Adult Boxer Dry Dog Food are packed with precise protein levels, which will help maintain their muscle mass. This dry dog food is enriched with L-Carnitine, Taurine, EPA, and DHA, that keep the cardiovascular system healthy. It also contains antioxidants that support cellular health.Because of their short muzzle, boxers may find it challenging to pick up food. 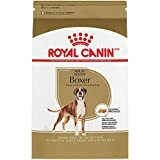 Royal Canin Adult Boxer Dry Dog Food designed its kibbles such that it will be easier for your boxer to get, and also encourage him to chew. 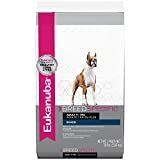 The EUKANUBA Breed Specific Adult Dry Dog Feed is formulated with animal-based protein, which will help build lean muscles for a maximized mobility and body condition. This also strengthens bones, hips, and joints of boxers. This dry dog food contains natural taurine and L-carnitine that are important nutrients to keep the cardiovascular system healthy. It also boosts a 4D DENTADEFENSE System, which is verified to reduce tartar build-up.Its main protein source is chicken. EUKANUBA claims that your boxer will enjoy the delicious taste of real chicken. Taking into account the aforementioned considerations into account, we believe that the best dog food for boxers is the EUKANUBA Breed Specific Adult Dry Dog Food. With the boxer’s nutritional requirements in mind, It is especially formulated for this specific breed. It is packed with animal-based (chicken) protein, and enriched with L-carnitine and taurine. All these will keep the boxer holistically healthy. It also proudly features a DENTADEFENSE system that keeps the teeth clean and free from tartar. It balances soft and crunchy, which is perfect for a boxer’s jaw. Some says that this specialized dog food may cause your boxer’s coat to become coarse or dry. However, it in fact has a substantial and healthy amount of Omega-3 that will keep the coat and skin soft and shiny.